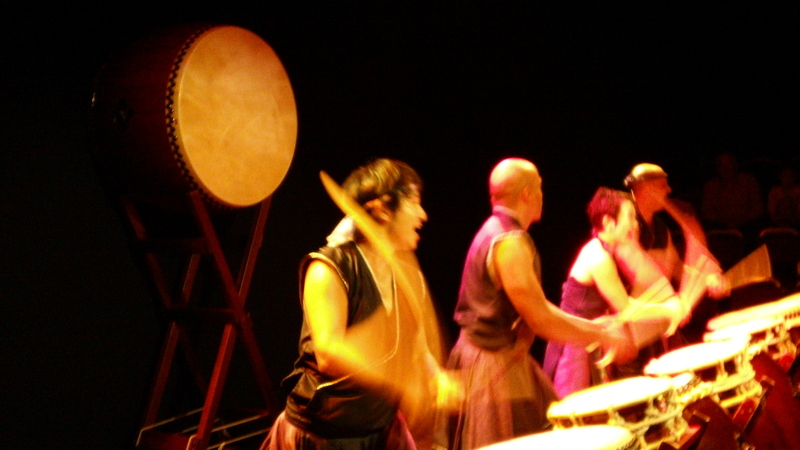 Wadaiko Tokara, a Taiko drumming group from Japan is currently in the Edinburgh Fringe as part of a world tour. In this era of health and safety awareness, a sign by the booking office tells all; ‘Mountain Wind: patrons should be aware that this production contains drumming’. It sure does! And get this, some of it is very loud and very fast. It is also enjoyably infectious. 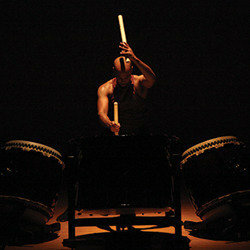 Taiko drumming melds together a very fluid style of drumming, dance and martial arts. One of the pieces is an arrangement of a traditional item but this repertoire adds a number of original compositions by the group’s affable founder and artistic director, Art Lee. These four performers are very fit – and no wonder – they all do 200 push-ups and 400m sit-ups and a 12km run every morning before breakfast. It shows, too in the disciplined choreography of this performance. If you like percussion, this show is unmissable. It’s banging great fun.